The Serpentine gallery in Hyde park is currently showing 40 rarely seen drawings of visionary artist, healer and researcher Emma Kunz (1892–1963). This is an important exhibition because it showcases the work of one of the pioneers of abstract art, providing insight into extraordinary, and largely unacknowledged creative innovations that were occurring in the middle of the nineteenth century. Emma Kunz used radiesthesia as a drawing technique, where she would pose a question to her divining pendulum and discover the answer within the geometric drawing she made from recording the pendulum’s swings, starts and stops onto graph paper. She was known to work continuously on each drawing for periods that could stretch over twenty-four hours.Kunz sought to gain a greater understanding of nature and the world through these drawings, and her questions to the pendulum ranged from the political to the philosophical and personal. Emma Kunz is the only one of the three artists mentioned above who did not receive any artist training. It was not until the age of forty-six that she began to produce large scale drawings on almost square-cut graph paper. She drew to explore the laws and forces of nature’s regularities. The starting point was her own body, as well as her concentrated attention to nature. She approached her healing practice in the same way. By completely surrendering herself to the energy flows, she directed the damaging forces onto herself, and transformed these into healing energies. There are astonishing reports of her healing successes. (World Receivers). 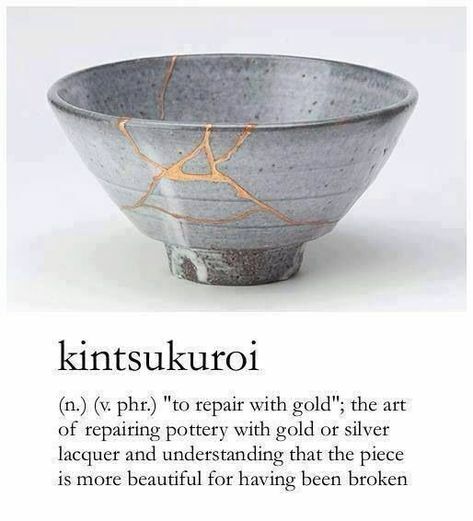 Inspired by the ancient Japanese art of Kintsukuroi, participants of the creative wellbeing groups worked with the metaphor that wounds and imperfections make us stronger: we become more beautiful for having been broken. Dod yn ôl at fynghoed: this is the title of the latest Creative Schools project I am working on in Tonypandy. In Welsh, it translates as “to return to my trees”, or “to return to a balanced state of mind”. The aim is to bring the children back into contact with nature through outings, stories, and creativity: collecting and printing leaves, working with clay, and willow weaving. There is a small area in the school yard that is to be transformed into a nature portal, a magical area the children can retreat to. Discovering a fairy stone, and puffball mushrooms. Doing leaf rubbings using wax crayons. Clay sculptures inspired by the woods and stories. As part of the Lead Creative Schools scheme – a joint Arts Council of Wales and Welsh Government initiative – Year 3 children at Beaufort Hill Primary School in Ebbw Vale have been collaborating on a storytelling project. They have brought together a small group of creative practitioners to help them create their own stories based on The Greedy Zebra and The Crafty Chameleon by Mylene Hadithi, making masks, creating performances and dance. I have helped them to create four banners of their stories using a combination of cyanotype and monoprint. For the first workshop, I asked the children to draw their impression of the stories onto acetate. I then printed the drawings onto the material back at the workshop. For the second workshop, the children created borders around the prints using a selection of leaves to print impressions in different colours onto a yellow background. I was impressed how quickly the children picked up the stages of the printmaking: squeezing and rolling out the inks, placing their leaf carefully onto the inked plate, covering it with paper and rolling again until the ink had saturated the leaf enough to get a strong print, peeling the leaf carefully from the plate, transferring it to the banner, and rolling it again to create the impression. They worked in small teams, experimenting with colour combinations and enjoying the chance to get messy!